i sort of regret having labelled a previous blog post romantic tosh. off the back of a piece kester had written suggesting that the emerging church had retreated to the institution i rang him up to say i thought it was romantic tosh and went on to say why. that was a private conversation. but kester then proceeded to out that conversation on another blog post so i felt compelled to blog something possibly against my better judgement. having done that has made it difficult to know how to get into a review of other but here goes. it's a great title - i wish i'd thought of it. as soon as i saw it i wanted to read the book because it's one of the big questions that i struggle with. how do i be a good neighbour/friend to people different than me and at the macro level how do we create a society that lives with others in peace. it's a great cover - love it! it's a great framework - kester takes jesus summary of the law and explores three relationships with self, god and others. the subtitle is loving self, god and neighbour in a world of fractures. what might love for the other mean in each of these dimensions? this was a framework that we used (thanks to kev and ana draper) to explore the labyrinth only we had a fourth which was the relationship with the planet. each of those three makes up a section of the book and he then concludes with some practical suggestions of what this might look like. I wrote it precisely because I KNOW that my practice is lacking, that I know I need to do better. One line that got cut from the front, which I kind of wish I'd insisted on leaving in now was 'I wrote the last book to challenge others; I've written this to challenge myself.' So no, there is no self-deprication, because there's little I can claim to be doing which deserves any great praise. But I've written the book to try to change that. We'll see how it goes. i think it would have been good to add a bit more of that tone in the book. The second half of life is the life of the father, the parent. To the young it may seem that life is over by this point. Our parents are boring and square. They don't have the radical energy and iconoclasm of their children. It will be painful I imagine to hear my children say this. And I realise now it must have been painful for my parents to hear this from me. But I begin to see now it is only in the move towards the individuality, the security, and maturity of the second half of life that we begin to become the sort of selves that can live in harmony with others. At the same time I see that there are still many dark nights to be navigated, many hours spent awake waiting before the legal self dies and grace begins to move in me. this section then opens up the challenge of darkness and struggle as part of the journey of the self. kester unearths a gem in the fantasy cycle from booker's book the neophiliacs. there's lots of wisdom here, lots to chew on. I am not entirely familiar with the inner workings of the selection process for ordination in the various Chrisian denominations but I'm fairly sure that a willingness to slaughter in the name of God is not tested very often. in terms of loving our neighbour, the other within society (we're now into the third section of the book) kester says two values are important - locating what we do in the economy of gift, and that we should lean towards the temporary because it's only in the temporary that violence that is required to maintain structures of oppression is mitigated. i love the notion of gift and want to be a generous and gift giving person and think that it is something our communities should aspire to. but kester is in danger of being ungenerous himself in his example- he critiques soup runs as patronising, as a power play, hospitality on our turf and terms suggesting that a feast is a better idea as we become artists of the invisible. it sounds great but my question is a simple one. how many feasts with strangers have you had? and especially if it seems you can't be the one hosting because that's a power play so they have to spontaneously erupt?! if i buy into this notion, then it's meaningless if those ideas don't have legs - i just can't imagine what those legs are. he goes on to hold up the food pantry in section four as a shining example but that sounds like what he criticises here. i'm not trying to defend soup runs per se - this just opens up what i perceive to be a massive problem in this section of the book. it's too idealised. it may be that it's about putting the ideas out there and it's for others to do the work that gives legs to the ideas. but overall i ended up being almost entirely unconvinced by the stuff on temporality. kester draws on hakim bey's notion of the temporary autonoumus zone (TAZ) - in a regime of power people find gaps in the maps away from the authorities to create something short lived, temporary, that dissolves before the authorities can latch on to it and it dissolves to re-emerge elsewhere. the rave scene, festivals, flash mobs and so might be examples. it's not that temporary is bad or wrong. i think that the idea is great and have enjoyed lots of these temporary type spaces and think that reflecting on how to create some is a great idea. it fits well particularly with the worlds of art and performance and celebration. my issue is that as a strategy for loving the other it's close to hopeless. the lid is lifted off this in the final section when i actually physically breathed a huge sigh of relief when kester tests this idea on esther baker (yes my younger sis) who works with prisoners. she says prisoners need permanance or at least solid ground. there you have it - the poor, the marginalized, the real other probably won't get included in our TAZ. so the suggestion of church as TAZ is naive at best. i think it's simply the hyperbole that got to me - TAZ as part of what church is about sounds great. kester holds up the death of vaux as some sort of heroic act and suggests in a comment on one of his blog posts that maybe 5 years is an ideal length of time for some communities to exist. i just can't go with this. i have no problem with things ending and clearing space for new things to emerge but thank god for communities who are faithful and offer some welcome for those who simply won't make it to church as TAZ. you get depth in relationships through commitment and longevity and even stability. ironically i fear the world kester describes works best for the postmodern flaneur (or pirate or heretic or trickster or tactician or artist of the invisible) who has resources and a confidence about their person to tactically navigate the liquid world but in the way that they choose and here's the rub with who they choose (i.e. where's the other now?). they like to avoid fixation, keep their options open as the carnival goes by. in other words it's a world with me at the centre - indiividualism by another name. zygmunt bauman is the person who lays bare this world better than any other writer i know - he has pulled the rug from under my feet on this and held up a mirror to me as i actually like living like this and could live like this quite easily. is this our binding of god, our syncretism, our making of god and god's body in our image, the god of the postmodern consumer? in an article that simon hall pointed out to me bauman suggests that individualism has won out over community - people are simply not engaging in institutional life, in the political processes, in community, preferring instead this sort of temporality. but actually research suggests that the numbers doing anything in the way of activism a la TAZ are far less than even those in political parties - really where does it lead in effecting real transformation of an unjust society. probably nowhere near where committed engagement does. i was stung by this sentence from bauman - Such carnivals are séances during which people hold hands together calling the ghost of deceased community. Not an insignificant part of their charm is the awareness that the ghost will play but a fleeting visit and will promptly go away when the séance is over. the question kester's book raises on this for me is how does becoming the parent relate to this? isn't temporality as a tactic avoidance of taking up this call to parent? clearly kester doesn't think so. i do. one of the pratical suggestions at the end is church as TAZ and i know kester loves hyperbole but when he says things like 'against the model of church as permanent structure offering a familiar liturgical rhythm of worship which appears to take as its inspiration the parable of the persistent widow grinding God into submission through constant nagging... i offer a vision of christian life inspired by TAZ' it's just simply a cartoon that i can't take seriously. it's ungenerous and annoys me. kester has made me sound like a defender of the realm in a number of blog articles and this and i'm really not normally honestly! i have a vision of church as a community of others - the worldwide and historic body of christ - with theologies and bindings of god that are diverse and at times problematic. but if i don't connect in to this wide community then i'm just left with what i choose and those who choose like me. Thanks so much for writing this review of Other, Jonny. You've really put the finger on quite a few thoughts I'd had but couldn't quite vocalise. I have more thoughts myself, but I'm typing them with my thumb on a cell phone, so please bear with me. 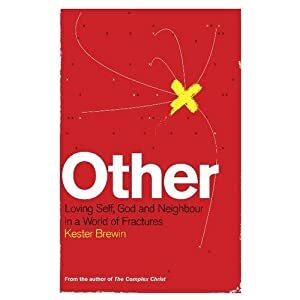 I must admit, I had a lot of high hopes for Kester's book, as I live on a very rough inner city estate in South London. I wanted this book to give me some hope, as well as some ideas, as I really struggle with living here. Whilst Kester is at pains not to be too directive about practical application, I've got to agree that the book tips over into idealism at points. It was great to be able to help me with my thinking, but for me it wasn't sociological enough. It's a great thought to be able to look into the face of the Other, and try to see how they see you, but what happens when the Other says "What are you f***ing looking at?" and punches you in the face!? I've just read a report by the Royal Society of Arts about the Woolwich model, or how citizens can tackle anti-social behaviour. In that report, they propose the idea that we can all effect change based on the First Aid model. First Aid was created so that ordinary citizens can deal with basic medical stuff on the street and at the scene, originally in times of war. It's something that people can be trained in and certified in, with the requirement to be re-trained every 5 years to hold onto that certificate. Applying that model, the report goes on to suggest that basic community safety skills such as how to spot a violent or potentially violent situation, how to remove oneself safely from such a situation coupled with some simple training in negotiation, conflict resolution and some skills that are used by hostage negotiators. For of this ties in with Jonny's thoughts about how the trickster figure can tactically navigate through a liquid world. I have many further thoughts, but my thumb is starting to ache. In short, I'd say definitely read K's book. Much to delight over, much to annoy, but as ever, always makes you think. I really wanted to read this but I'm a little weary of pontificating that isn't tied to reality. I think its no good just putting ideas out there because you are someone with a voice, if you haven't taken the time and made the commitment to live these out somewhere, in an organisation or community, and begun to grapple with the real problems and difficulties, and then applied theology and principle to those tough edges. I'm sorry if I sound cynical but the world needs us to really show how this works, and to show that it works, not to just talk about it. Kim, obviously I'd like you to read it, and I want to defend the book for NOT be didactic, for not telling you what to do. My aim is to give some principles by which people can act in locally relevant ways - not to tell people how they should act in their own unique situation. It's very tempting to write that sort of book, but I genuinely do not think that those things help. We like to think they do - but in my opinion it is far better to teach people to fish, not to just hand them fish on a plate. It demands more from the reader, I'll admit that, but I'll persist in doing that, and defend the validity of it. And, as Jonny has helpfully put here, I've not written the book as a celebration of my successes - quite the opposite. I've written it to challenge myself, and open a conversation about being the emerging movement being more socially aware. Too often we look to books to give us all the answers, but that, I feel, abdicates responsibility from the reader, and this is dangerous and unhelpful. May be hard to appreciate, but I'm not worried about sales! I am concerned that ideas are put out, debated and integrated. I'm sorry if you're after a text book on how to be more socially active. I can't give you that. I'm just wondering - as your book is intended to start off a process as you say, I'm just wondering if there's a possibility to feedback via your blog about how people might work out in that practical local way? I've wanted to respond for ages, but never quite found the right space on your blog to do so. I think it's great that your book starts a conversation, and is a learning process for the author as well as the reader, but I'm just wondering where the space is for people to work these things out, and I think it would be good for you to foster that space beyond the book, but in a public forum of some sort (as well as in people's own lives of course). I'm not even sure if the blog is the right answer - though it might be. Good idea Mike. I'll have a think about what might be a good way of doing that. I'd like to get people together physically as well as virtually too. I'm away next week, but will ponder! Kester, appreciate the response. I just wonder, as there are so many people out there already grappling with the realities of living with this and what they have already learned, who have written for all our benefit, whether you would have been better off just going off and working that out yourself and living with it, then writing a book afterwards? A prayer journal or an accountable prayer partnership would maybe be a more useful place to challenge yourself, rather than a book perhaps? I'm not looking for a textbook personally (is anyone these days?) as I am working out what is helpful and applicable in the context I am operating in, but I think if you write a book in the emerging context it should have something practically or spiritually useful in it. For me a book on mission has value out of a crucible or furnace of experience/praxis rather than just wondering. It's a very good question. I'd say - and I think Jonny's and others' reviews highlight - that there is a lot in the book that is 'creative and provocative' and with reference to your comment above, I think it does have 'something spiritual and practical' to say! Lots, actually - and I wonder if you've taken the wrong idea from the review that it doesn't have anything practical in it. But it's not going to tell you 'do this, do that.' Rather, it takes a step back and deals with the environment within which stuff might get done. And I strongly believe that that is right. How about the idea though that in every environment we need to be able to get stuff done, this stuff of the Kingdom. We can push on and just do it regardless of the environment, which will make the environment itself change as a by-product, or we can work to change the environment to enable stuff to happen. I think both are equally valid but the Spirit will illuminate what the combination of circumstances and personality of the people doing the doing would most likely make work. Hope this provides some clarification as to what I mean by TAZ and how I'm trying to use it... which is not to get away from justice and the other - precisely the opposite! Kester is in danger of being ungenerous himself in his example- he critiques soup runs as patronising, as a power play, hospitality on our turf and terms suggesting that a feast is a better idea as we become artists of the invisible. it sounds great but my question is a simple one. how many feasts with strangers have you had? I hope people don't read that and think that I'm somehow against ministries like this that serve the poor. What I'm doing in that section of the book is take an way of engaging 'the other' - like a classic model of a soup kitchen - and see how it stands up in the light of the philosophical and sociological problems that might be thrown at it. And there are some problems which I do think it's vital to reflect on. As for feasts with strangers, well I have had quite a few! The best example, which I should perhaps have put in the book but didn't because it was some time ago, was the feasts that The Safe used to run out of St James the Less. Here was food prepared by a core of homeless/vulnerable people and served and shared with many other homeless people from around London as an act of celebration. Having gone along to 'help', and feeling all good about myself for doing so, I found that I ended up being served by them, not the other way round. The power relations present there were very very different to any other similar ministry I'd seen before, and the experience profoundly affected me.